Absolute beachfront, stylish and private house. Pet friendly. Fireplace. Watch dolphins from the living room. Pavilions House is a big, comfortable, private, casual, stylish, architect-designed, fun, absolute beach front family beach house with a cosy open fireplace in the open plan living area. It is well suited to two or three couples and kids, or a group of friends, but also great for a romantic stay for one couple using the main pavilion only. Free Wifi. Pets Welcome. 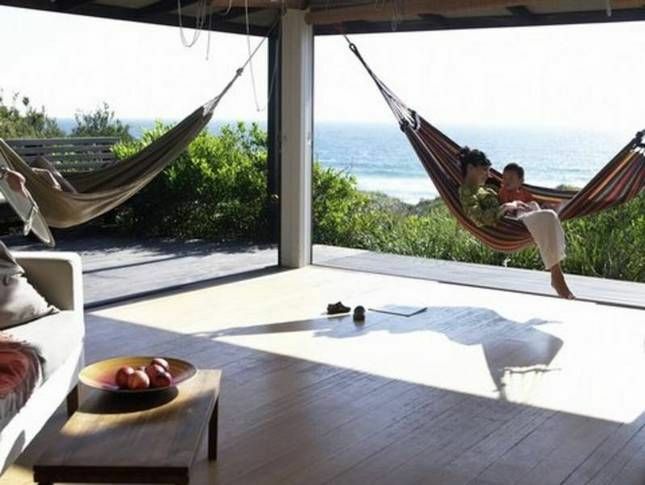 PAVILIONS HOUSE ON THE BEACH WAS SELECTED AS ONE OF AUSTRALIA'S BEST BEACH HOUSES BY THE WEEKEND AUSTRALIAN NEWSPAPER. Travel writer Kendall Hill dons wide-brimmed hat and zinc cream to seek out Australia's best beach houses. "...This tasteful, two-storey beachfront house, on one of the NSW's South Coast's least spoiled beaches has had a designer makeover. The timber-floored living area opens to a wooden deck that gives on to scrubby sand dunes and the rolling surf of Culburra. Living areas, bedrooms and even the indoor-outdoor bathrooms have been cleverly designed to maximise sea views. A cool children's bunkroom makes for big happy families." Pavilions On The Beach was designed 20 years ago by Andrea Wilson who studied under award winning architects Richard Leplastrier and Peter Stutchbury at The University of Sydney in the 1990s. Designed as a family holiday house, it has ocean views from every room, an open fireplace and fun and exciting features throughout that intend to take residents away from the quotidian. The floor to ceiling windows of the living area open the house entirely to the outdoors, the private garden and ocean views, the games lawn and deck dining area. The inside/outside design combined with the north/east aspect are great for Australia's casual summer beach holidays but also capture the sun throughout winter days. The living area has a flat screen TV which receives all the high definition channels as well as regular free to air channels and a DVD player. Residents can play their own music throughout the house and onto the deck by connecting to the sound system. There's also a record player and selection of vinyl, reading library, DVD library, board and lawn games. The fully-equipped kitchen shares the living area's spectacular ocean views and also opens up to the garden. The open plan layout grants those in the kitchen unhindered interaction with those in the living area, on the lawn and even in the Japanese bath when the louvres are opened. A Heston Blumenthal-designed barbecue is in a sheltered area close to the outdoor dining area. A Google Home device in the kitchen can step you through recipes on request. In both bathrooms, residents can shower with the doors flung wide open to the views: great for the sandy return from the beach, but possible at other times as well because of the privacy afforded the residents by the mature Banksia trees around the garden perimeters. The main bathroom has a deep Japanese bath surrounded by louvres that can open up to the living and kitchen areas and the views beyond. Little ones love the Japanese bath although it was designed with adults in mind. The loft King bedroom, with huge sliding panels opened up, has views to the north all the way up the coast and views of the beach in front. It has romantic lighting, its own flat-screen TV with DVD player and a study area with desk and chair. The Queen bedroom opens to the views and garden with french-doors onto a deck. It also has its own flat-screen TV and DVD player. Every bed in the bunk room has its own small awning window and reading light. The room contains a double bed and seven single beds, a flat-screen TV with in-built DVD player. It's located near a bathroom and far enough away from the adult areas of the house so the noise of children's games won't disturb. The optional linen service is performed with crisp, white, pure cotton linen and makes bedtime more inviting. Pavilions House on the Beach is surrounded by a mature, indigenous garden planted for privacy from neighbouring properties with dune species that provide habitat for local wildlife such as the Bilby (rare but occasional sightings). There is a fully fenced yard on the beach side of the house and a lawn directly in front of the living area for little ones and adult games like boules, shuttlecock or volleyball. Residents can be in the living area, on one of the decks, or in the kitchen and still be part of the action on the lawn. Residents walk down to the beach across this garden under mature Banksia trees, they enjoy an all-day-long sunny north-east aspect to water views from deck chairs on the decks and lawn and watch the local birdlife visiting native plants surrounding the house. A Google Home device at the house will answer questions about local shops and services. Its linked to Spotify Premium so residents can ask it to play favourite songs and it will host a trivia night. There is a large, fully fenced yard for your pet with plenty of space for it to run around and explore and shady places to lie around. A resident pod of dolphins can easily be viewed from the house, sometimes surfing the waves directly in front. Almost all of our guests report having seen them. You might see whales too if you stay during their migration seasons. Directly in front of the house is a section of the beach favoured by surfers so if you're a surfer, you're front and centre all day to watch the conditions. The south end of Culburra Beach, a short stroll along the sand, is great for small children as it's sheltered and there are rock pools to explore both there and at the north end. Unfortunately we must decline function requests. Our insurance doesn't cover a commercial use of the house and the zoning of the property doesn't allow for its use as a function venue. Please accept our apologies. We offer a linen service (beds made up for arrival in white 100 per cent cotton sheets and white 100 per cent cotton towels) at a charge of $25.00 per person which, if requested, is paid separately by bank transfer. The linen service is offered for the convenience of our guests and is charged to you at the exact rate we pay for it. In the small Australian beach town of yesteryear, Culburra Beach on NSW's picturesque south coast, is just more than two hours drive from Sydney. Culburra's comprehensive shopping strip will service all of your holiday requirements. Culburra Beach is one of NSW's only remaining unspoilt beaches. Surf, swim or fish on the beach directly in front of the house. You can go lake fishing and enjoy other lake activities also in Culburra at the local lake. There are good restaurants close by and excellent fresh seafood available from the nearby fishing village of Greenwell Point including its famous oysters. You'll get great local prawns at Orient Point nearby. There are five golf courses close by. Horseriding, canoeing and archery is 50 mins away at a place called Valhalla. There's a bicycle track close to the house, great walks along extensive beaches and two boat ramps at the nearby lake for boat launching. Culburra Beach is one of the few beaches on the South Coast which allows dogs. For a night out there's a local restaurant, The Butter Factory, that recently won a Restaurant and Catering Association award for the best South Coast restaurant. It serves modern Australian cuisine with an emphasis on fresh, local produce. On Friday and Saturday nights the restaurant operates a seven-seater bus to collect parties of four or more people from the local area. Making this home as beautiful, relaxing and comfortable as possible has become my obsession. I aim to anticipate as many as possible of my guests' needs and desires so that their holiday is as seamless as possible. Time is precious and holiday time especially so. We designed and built this property specifically as a holiday house on the beach. It has fun and imaginative features like a Japanese bath that opens onto the living/kitchen area, bathrooms that open to the outdoors and a cool kids' bunk room with individual lights and windows for each bed. The architect imagined a house as far from suburban but as comfortable as possible. Watch whales and dolphins from the living room and kitchen. Be involved in family games on the lawn from the comfort of the living room. Bring your dog for walks along the beach. Sit around the fireplace in the evenings and play records on the record player. (The cook can join in from the kitchen.) Choose a book or magazine from the extensive collection or find a board game the whole family can pay. This house was designed to feel different to a suburban residential home so that its occupants feel like they are somewhere unique and interesting and away from ordinary life. It was designed to take advantage of the north-east-to-water aspect with every room enhanced by light and water views. The architect was successful in creating a fun and exciting holiday environment. toilet, shower, Indoor/outdoor shower. Opens to beach views while showering. The town of Culburra Beach is a country town on the New South Wales south coast surrounded by National parks. The village of Culburra Beach is a 10 minute walk from the house. You'll find everything you need there including a supermarket, restaurants, pharmacy, post office, news agency, cafes and bottle shop. You're front and centre for beach views from the house. The ocean is just metres away. See the ocean from every room. The house is absolute beach front. Open fireplace, wall mounted electric heaters throughout. Pillows, donnas & covers, tea towels, napkins & bath mats all supplied. For sheets, pillow cases & towels, hand towels & washers we offer a 100% cotton linen service upon request for $25 per person. Fischer and Paykel sensor dryer. Two extra carports under the house. Free mobile wireless wifi is available. Passcode in the house manual. Google home device is there for quick questions and is hooked up to Premium Spotify for music requests. Bath towels, hand towels & face washers are provided along with sheets & pillow cases with the optional $25pp linen service only. Adults 2 towels each & children 1 each. Beach towels are not provided. Open plan living area off the kitchen and dining area with wall mounted TV, record player and fireplace. Extra wide electric fan forced oven. Six slice toaster in cupboard. Starter kits of coffee capsules and specialist teas. Sugar and UHT milk. Balsamic vinegar and olive oil. Salt and pepper. Placemats and paper napkins. New saucepans and cooking utensils. 14 place dinnerware. 14 person cutlery. Wine, water and champagne glasses. Glass coffee and tea cups. Internal, raised dining area with ocean views in an open plan space. Seats 13 when the banquette is used. Child's high chair available upon request. Outdoor dining area on the deck. Record player with vinyl library. CD player. Both hooked up to the sound system with speakers. Google Home with Premium Spotify account to request any music from the Spotify library. In-built DVD players in all bedroom TVs and a separate DVD player in the living room. Extensive collection of books and magazines throughout house. Various lawn games and sports games, board games and card games. Vinyl collection plus Google Home Premium Spotify account. Level lawn in front on the house facing the beach visible from kitchen, living and dining areas for lawn games. Native garden facing beach. Wrap around decks with dining area. There are public tennis courts nearby at 3 Prince Edward Avenue, Culburra Beach. There are several public golf courses a short drive from the house. Japanese bath in main pavilion bathroom with views out to the ocean and opening onto the kitchen and living area if desired. One person only. Ultra relaxing property in a prime location on Culburra Beach. My family (husband, two sons and their partners) enjoyed a very relaxing few days at Pavilions on the Beach. The house seems to create a wonderful atmosphere of tranquility and calm. The wonderful view enhances the entire experience. The house has a choice of dining areas- a more formal and extremely large interior table and another table built into the side deck. We ate here whenever we could. The beds were comfortable and the linen that we included as part of our accommodation package added to our comfort. The small patch of grass across the front of the property was reminiscent of the Hamptons. Lovely to sit in the outdoor chairs in this area and absorb the view. The gardens complement this property. Large Banksias surround the perimeter and enhance the privacy for those in residence. We strolled the beach which is easily accessible from the house. As we had our elderly dog with us we appreciated the enclosed garden. A holiday in a place like this guarantees relaxation! Thanks Robynne. So very glad you all enjoyed your stay. We hope you'll all come back, including the pooch. It was lovely having you. Being able to take the dogs on holiday and have them inside as well was brilliant. The yard is secure (as long as they're not jumpers) and the house location was great. We had a gorgeous holiday here. The beach is so easily accessible, and we barely wanted or needed to leave the house except to swim. It easily accommodated many adults for a relaxed getaway. We could've done with some more microwave containers in the kitchen but it is otherwise very well equipped for breakfast, lunch, and dinner. The house is a gorgeous layout but because of proximity to the beach the house could use some TLC. Fantastic views and great for kids and dogs to play on the dunes and the beach. Hammocks were a huge hit with everyone! We enjoyed our stay and loved exploring the area and different beaches. Great base for showing our OS guests the Jervis Bay region! We stayed with our family, 4 adults and 4 children, 3-9 years old. We wanted to show them a slice of Australian beach living, and it was divine. Plenty of room to spread out and have our own space. The house is stunning, easy communal areas and it opens right up to let the outdoors in. Our two pooches loved it too. Thanks Floria. So very, very glad you enjoyed the house. It was a delight having you and your family stay. A beautiful spot on the coast. Very quiet and comfortable. With breathtaking scenery, beautiful beaches and crystal-clear waters, the NSW South Coast is home to many memorable experiences. Explore spectacular national parks, watch whales and swim with seals, enjoy fun water sports as well as cycling and bushwalking, and savour Australia’s Oyster Coast. Relax and swim at beautiful beaches, enjoy fishing and kayaking on sparkling waterways, and taste succulent oysters from the Crookhaven and Shoalhaven estuaries in Culburra Beach, a small seaside town on the NSW South Coast. Warrain Beach is another nearby surf beach and a major attraction where surfing, swimming, fishing and relaxing on fine white sands are popular activities. The Nowra Culburra Surf Lifesaving Club patrols the beach, south of Penguin Head. Culburra Beach Surf School offers surfing lessons and board hire. Just north of Culburra are Crookhaven Heads Lighthouse and Crookhaven and Shoalhaven rivers, part of Australia’s Oyster Coast. You can taste succulent local oysters from Jim Wild’s Oyster Service at Greenwell Point, a charming village on the Crookhaven estuary and a short drive from Culburra. Explore the waterway in a boat or kayak from Anglers Rest Boat and Kayak Hire at Greenwell Point, where the Riverside Markets is held on the third Sunday of the month. Just west of Greenwell Point is picturesque Pyree, where Pyree Village Art and Handmade Market is held on the fourth Sunday. Nearby attractions include giant waterslides, Australia’s highest zip-line and tandem skydiving and hang-gliding. Jervis Bay & Shoalhaven is a majestic stretch of coastline endowed with beaches and natural attractions. The kids will love Jamberoo Action Park, New South Wales' favourite water theme park is located within an hour drive of Culburra Beach. With gardens and parklands, it's the perfect setting to relax or join the kids on a huge range of water slides and attractions. The Perfect Storm is the Tallest, Longest, Fastest water ride ever built. Not one … Not two … But three tornadoes twisting and rotating around each other will combine to create The Perfect Storm. Valhalla Horse Riding is closeby in Nowra and besides horse riding you can do canoeing and archery there too. There are several close by public golf courses and links.